Founded in 2007, Vorex builds professional service automation and project management software for small and mid-size businesses. This includes project management software, billing, expense tracking, and invoicing solutions. Its all-in-one solution is unique because companies can use it to keep everything from customer resource management (CRM) information to human resources (HR) data in one single location. Designed around the concept of a vortex, Vorex pulls data from all over, identifying and compiling information from all areas within the company. 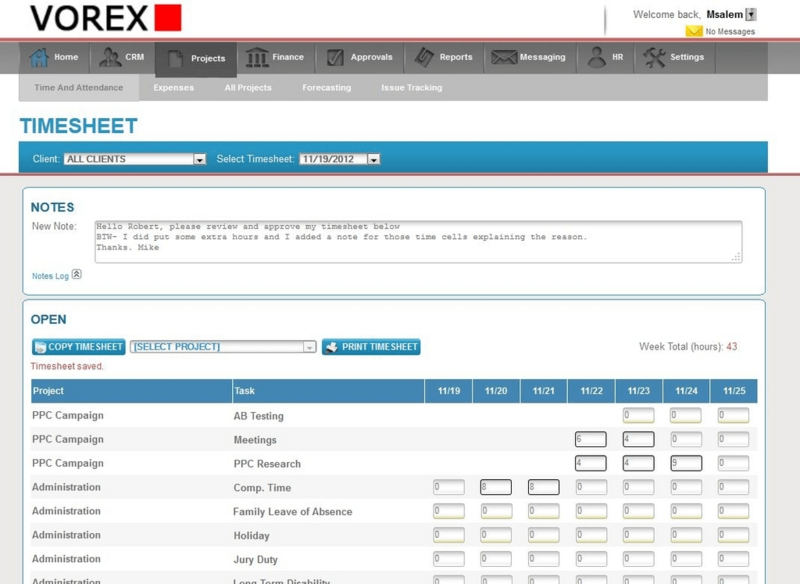 The Vorex web-based project management software helps businesses track time, expenses, and other project related materials in real-time. It gives clients instant access to general project information as well as financial, staffing, and analytics information. Customizable task and reporting capabilities allows users to manage an unlimited amount of tasks, projects, and clients without confusion or overlap of materials. Vorex provides built-in CRM and Invoicing modules in real-time which gives managers the opportunity to convert a lead into the project as well as input billable hours and expenses all in one feature. It also encourages team collaboration to improve resolution time and track any potential issues. A unique feature of Vorew, Smart Staffing matches employee skills to the projects they are best qualified for. This results in faster project completion times, increased employee and customer satisfaction, and increased effeciencies. Find the best project management software for your business using our Project Management SmartAdvisor. Learn everything you need to know about Vorex. Our experts will reach out to you shortly.